​Providing for a variety of outdoor activity in real estate development plays to people's desire to enjoy the outdoors, creates a more dynamic social scene, and is good for the health of the community. Outdoors - A Preferred Lifestyle - There is an enormous range of things people like to do outdoors in a public setting. 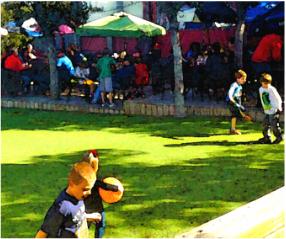 And some of those things make perfect sense from a lifestyle standpoint - things like creating an open, safe play area for kids that puts them within watchful eye of parents who are enjoying a meal on the outdoor patio. This gives young parents what they want - peace of mind - the chance to enjoy that meal on the patio without having to worry when the kids get a bit restless. And the kids like it too because they have a place that allows them to do the things kids like to do. When the kids like it, we benefit from the "McDonald's effect" (the kids will ask the parents to bring them back again), the only difference being that we have the things to make the parents plenty happy too (minus the clowns). 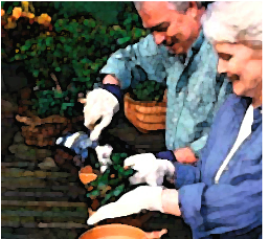 Outdoor Activity is for Everyone - Seniors may take things at a little slower pace, but that doesn't necessarily diminish their enthusiasm for outdoor activities. Gardening activities, biking or just strolling in a park setting are activities that are easy to provide once we create the amenable natural setting for them. A "Feel Good" Place - And for the younger adult crowd, an enjoyable waterfront setting for drinks, lawn games and quiet spots to relax and unwind with friends all make for a place that keeps on bringing them back. This is the kind of "feel good" place that we create, with things to do, places to go, friends to meet and the beautiful outdoors at the center of it all.